Becoming Jane is a 2007 British-Irish biographical romantic drama film directed by Julian Jarrold. It depicts the early life of the English author Jane Austen and her lasting love for Thomas Langlois Lefroy. American actress Anne Hathaway stars as the title character, while her romantic interest is played by Scottish actor James McAvoy. Also appearing in the film are Julie Walters, James Cromwell and Maggie Smith. The film was produced in cooperation with several companies, including Ecosse Films and Blueprint Pictures. It also received funding from the Irish Film Board and the UK Film Council Premiere Fund. 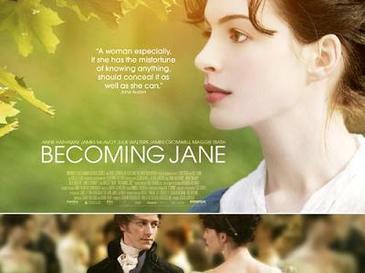 The film is partly based on the 2003 book Becoming Jane Austen by Jon Hunter Spence, who was also hired as historical consultant. The final screenplay, developed by Sarah Williams and Kevin Hood, pieced together some known facts about Austen into a coherent story, in what co-producer Graham Broadbent called "our own Austenesque landscape." According to Hood, he attempted to weave together "what we know about Austen's world from her books and letters," and believed Austen's personal life was the inspiration for Pride and Prejudice. Jarrold began production of the film in early 2006, opting to shoot primarily in Ireland as he found it had better-preserved locations than Hampshire, England, where Austen was raised. Released firstly in the United Kingdom on 9 March 2007 and in other countries later in the year, Becoming Jane earned approximately $37 million worldwide. The film received mixed reviews from critics. Hathaway's performance received mixed critical reception, with some reviewers negatively focusing on her nationality and accent. Commentators and scholars have analysed the presence of Austen characters and themes within the film, and also noted the implementation of mass marketing in the film's release.